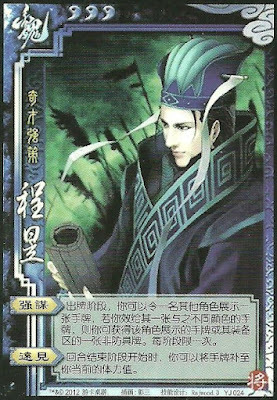 Once per turn, Cheng Yu can make one person show a hand card, he can then give that person a different color hand card, then he gets the displayed hand card or a non-armor equipment. At the end of his turn, Cheng Yu can draw until his hand is equal to his health. Cheng Yu can take horses and weapons with "Strong Plan", but he cannot take whatever armor they have. Cheng Yu cannot use "Vision" if he has more cards in his hands than health.